The American dream of home ownership slipped out of reach for more families last year as housing affordability fell in all major cities, according to an Interest.com study. Our second annual Home Affordability Study found that rising home prices and mortgage rates outstripped modest increases in family income in each of the 25 largest metropolitan areas. Prices have risen so much that a median-priced home was affordable for a family earning a median income in only eight of those cities, compared with 14 a year earlier. “The simple fact is that the very small improvement Americans have seen in their paychecks hasn’t kept pace with a jump in home prices and mortgage rates,” says Mike Sante, managing editor of Interest.com. On average, home prices rose nearly 16% over the last year in the 25 cities, while incomes rose by about 3%. Mortgage rates, although still low by historic standards, are about a point higher than they were last winter and spring, contributing to the decline in home affordability. Marshall Vest, director of the Economic and Business Research Center at the University of Arizona’s Eller College of Management, says home prices fell by up to 50% in the hardest-hit cities during the recession. “So what you’re seeing with the rapid increase in housing prices is simply a partial recovery," Vest says. "Affordability is declining here in recent months, but we’re coming off all-time levels of affordability. (Nationally) houses are still affordable at this level of prices." Lisa Sturtevant, director of the Center for Housing Policy, isn't so sure. She says low interest rates and relatively easy credit helped low- and moderate-income families buy homes despite decades of stagnant wages. Now they're being squeezed out of the housing market by some of the same factors that drove affordability down in our study — higher interest rates, more costly homes and even tighter credit. “If home ownership is going to remain a priority as part of the American dream, the current system isn’t working,” Sturtevant says. To conduct our annual Home Affordability Study, Interest.com gathers city-specific data on median home prices and incomes, average property taxes and insurance costs, as well as consumer debt and mortgage rates, from the most reliable sources we can find. The U.S. Census Bureau, National Association of Realtors, National Association of Insurance Commissioners and Experian, one of the three major credit-reporting agencies, all provide information. We then use two of Interest.com’s online calculators to determine how much a family earning the median income in each city can afford to spend on a house and how much a family would have to earn to afford that city’s median-priced home. You can use the same calculators we do to determine how much you can afford to borrow and how much you must make to afford any home. An Affordability Grade, with a C indicating that someone making the median income can afford the median-priced home. A Paycheck Power Rating, which is the percent the median income exceeds or falls short of the income required to buy a median-priced home. 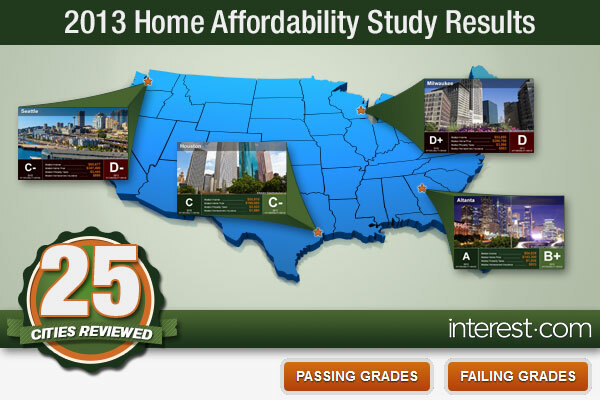 Only four cities earned an Affordability Grade of B or B+ in 2013, down from six the year before. We could award no A's. Atlanta came closest. It once again led the nation as the most affordable big city for housing, although its grade fell from an A to a B+. The city managed to stay on top despite a nearly 39% jump in the median home price, from $103,200 to 143,300. Even with that increase, the median cost of a home in Atlanta remains significantly below the national average of $203,500. “Atlanta is so affordable because we have no natural boundaries, unlike most cities, which gives us an unlimited supply of land, and because this land is less expensive, houses are less expensive,” says Nancy See, president of the Atlanta Board of Realtors. See adds that Atlanta also enjoys access to a plentiful nearby supply of building materials, including wood and brick. In addition, the city has a household income of $54,628, about 6% percent higher than the median national income, as well as lower-than-average property taxes and modest insurance costs. Other relatively affordable cities in the Interest.com study were Minneapolis, St. Louis and Detroit, which all scored a solid B.
Minneapolis benefits from a combination of median home prices that are slightly below the national average and a median annual household income of $66,282, which is $14,911 above the national average. The city’s grade is only held down by higher-than-average property taxes. St. Louis’ residents are helped by the second-lowest home prices in the top 25 markets and a median household income just slightly above average. Detroit’s situation is relatively unique. A surplus of empty or foreclosed homes has led to the lowest home prices among the top 25 U.S. markets, which makes housing affordable, even if the city’s overall economy is in bad shape. On the other end of the spectrum, the average housing price in San Francisco, San Diego and New York climbed even further out of reach for families with median incomes, according to our study. All three scored an F largely because their housing costs are the highest, or among the highest, in the country. San Francisco, for example, has a median income significantly above the national average. 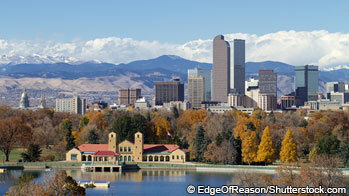 But the median home price of $706,300 topped our list. Even with high salaries, the city fared the worst in our Power Paycheck Rating, with the median income falling nearly 48% short of what is needed to buy a median-priced home. “San Francisco is a highly desirable place to live with a finite amount of real estate available within its seven-mile by seven-mile borders,” explains Christine Dwiggins, president of the San Francisco Association of Realtors. The Bay Area is also a center of high-tech industry and foreign investment in real estate, she adds. Prices jumped by nearly 28%, or a whopping $153,700, over the last 12 months. Across the United States, the rise in house prices reflected pent-up demand, says the University of Arizona’s Vest. With new construction largely shut down during the recession and many people holding on to the homes they have, supply fell short of demand, analysts said, which led to the jump in property values. Home prices aren't expected to keep that up in 2014, however, as supply catches up with demand, according to Walter Molony, a spokesman for the National Association of Realtors. “We see sales flattening," Molony says, "but prices continuing to rise at a more moderate rate … (of) maybe 5.5% to 6% next year."